Help children learn to listen carefully and make connections between soundsand the things that make those sounds. To play, students listen to the soundson the CD and place tokens on the images on their game cards that match whatthey hear. Each game set includes 12 game cards (5.5" x 8.5" each) with 8photos per card, 120 game tokens, an audio CD, and directions in English,Spanish, and French. It also supports NCTE and NAEYC standards. Key Educationproducts are intended to engage and educate young and special learners, aswell as assist teachers in building a strong and developmentally appropriatecurriculum for these children. The product linecomprised of teacher/parentresource books, photographic learning cards, and other activity- and game-oriented materialsis designed to assist in Unlocking the Potential in EveryChild." Key Education products are intended to engage and educate young andspecial learners, as well as assist teachers in building a strong anddevelopmentally appropriate curriculum for these children. The productlinecomprised of teacher/parent resource books, photographic learning cards,and other activity- and game-oriented materialsis designed to assist in"Unlocking the Potential in Every Child." From the Manufacturer Help children learn to listen carefully and make connections between soundsand the things that make those sounds. To play, students listen to the soundson the CD and place tokens on the images on their game cards that match whatthey hear. 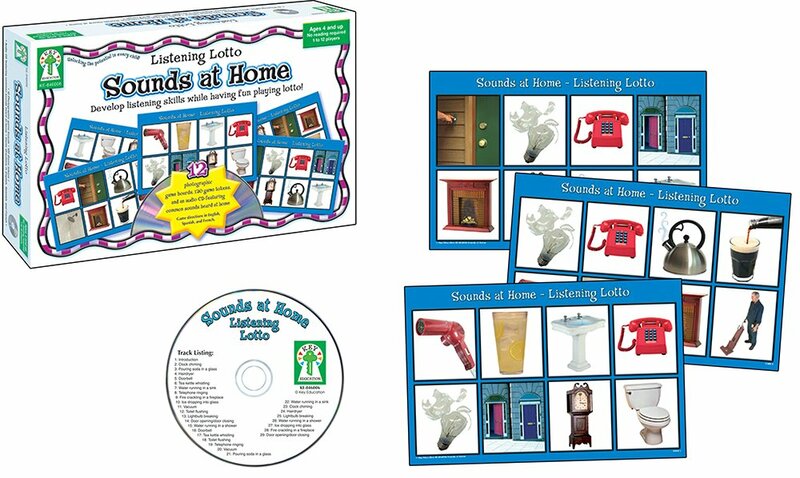 Each game set includes 12 game cards (5.5" x 8.5" each) with 8photos per card, 120 game tokens, an audio CD and directions in English,Spanish and French. It also supports NCTE and NAEYC standards.